My favorite these days is Minestrone in the slow cooker with a TON of veggies in it. I also like to whip up tomato, barley and carrot soup on the fly. We keep a Kosher kitchen, so we often do things vegetarian style. Thanks to great veggie broth and No Chicken Chicken broth, we are able to tweak many recipes. What is your favorite soup to eat on a cool winter day? Always looking for new things to make, so list as many as you can think of. That bean soup looks awesome!!! My favorite soup for winter is probably beef stew. For low point soup I make the weight watchers veggie soup. .-= Upstatemomof3´s last blog ..Peeeee! =-. I’m all about the Cheese Potato Soup in the winter. It’s so cozy and yummy. We also do a lot of ham n beans, I guess it’s not technically a soup but pretty close. .-= Cat @ 3 Kids and Us´s last blog ..Aloha Friday – Superbowl Snacks =-. I love Potato and Corn chowder, and Chicken Tortilla. Really though, I love pretty much all soups. Yum! .-= Angela´s last blog ..Tag, you’re it! =-. .-= Jennifer´s last blog ..Book Tour & Review: Schooled In Lies by Angela Henry =-. I like potato soup and chili. I’m not a big soup eater, but I’d have to say I do love the Mexican Sopa de Fideos……I’ve only had it in restaurants but I love it. .-= Debra @ A Frugal Friend´s last blog ..Magazine Deals $5.00/yr =-. My sister makes the best vegetable soup! Yummy!!! My favorite is Cheese Potato Soup! Yum! 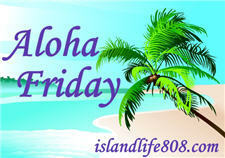 .-= Natalie A.´s last blog ..Aloha Friday! #3 =-. Ooooh, those look so YUMMY!! .-= Kayla´s last blog ..Health Update Thursday(2/4) =-. A good Chicken noodle soup homemade. Yum. My Grandma used to make me some good bean soup! I loved it! Now i also love smoked ribs soup or chicken soup! 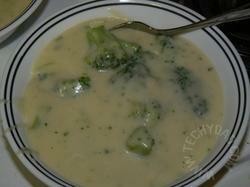 I love potato broccoli and cheese soup! I usually just settle for bullion because I’m on a diet. I love egg drop soup! oh yum!!! If you don’t mind, enter my Holey Donuts giveaway. You can win free donuts & TWO gift cards and I can win cash. .-= jerrica puckett´s last blog ..Holey Donuts Giveaway!! =-. I love homemade chicken noodle. Delicious! 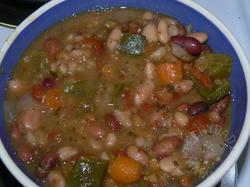 Can you send me the slow cooker bean soup recipe? Sounds delicious! My husband makes and unforgettable miso soup with tofu and green onions. It is out of this world! I also love making the weight watchers garden vegetable soup and of course homemade chicken soup with matzo balls…delish!! !